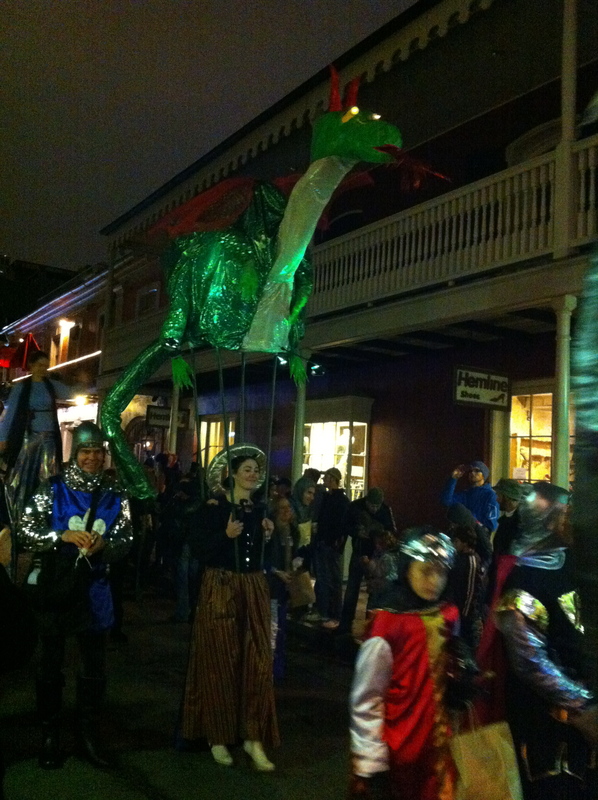 Last night I went to one of the first parades of the New Orleans Mardi Gras season, the Krewe de Jeanne D’Arc Parade. 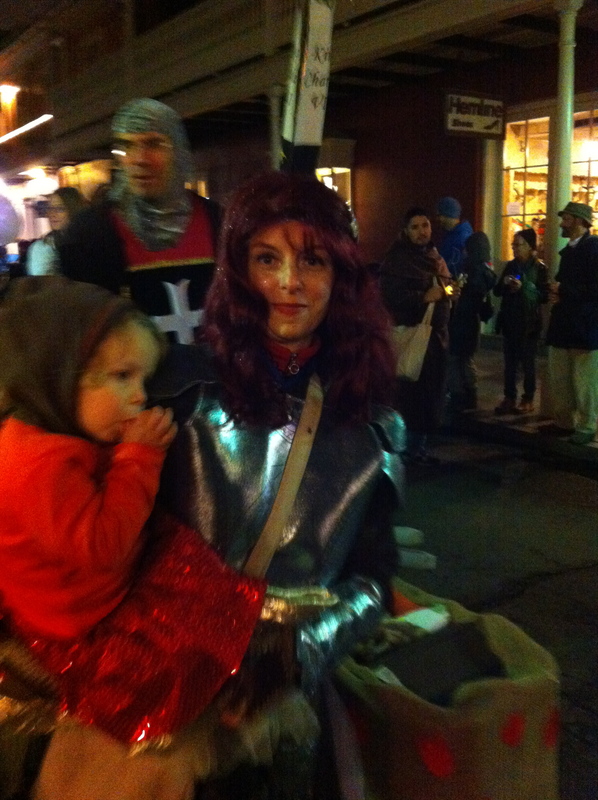 Joan of Arc is the patron saint of New Orleans; that should come as no surprise. 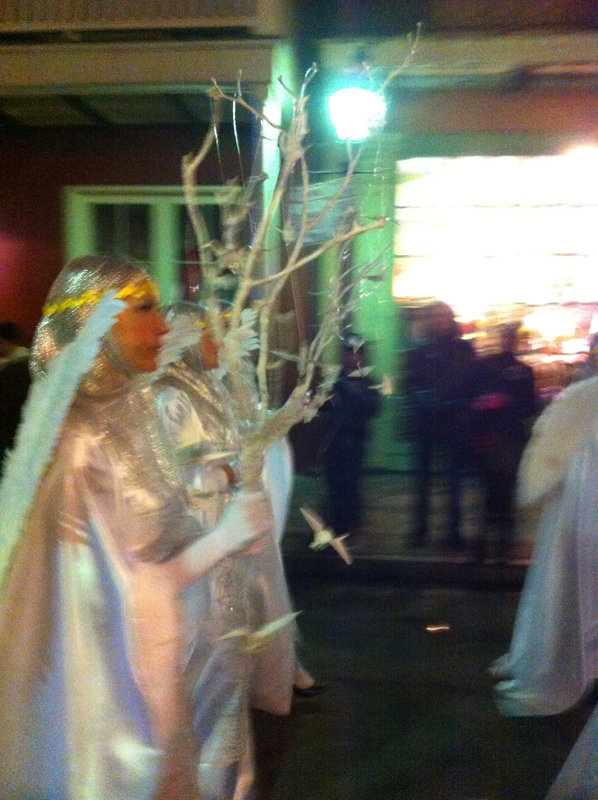 She was the Maid of Orleans, after all. 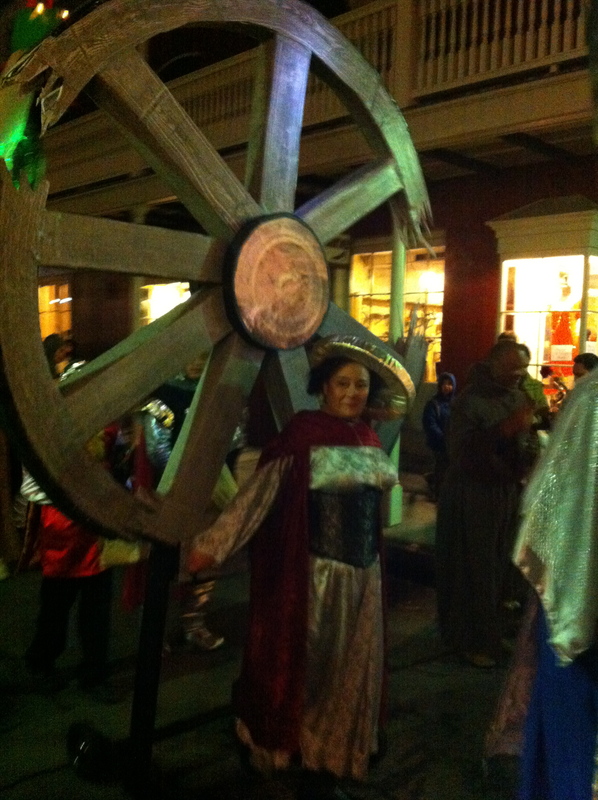 New Orleans is a very Catholic city, and St. Joan is one of my favorite parts of the Catholic mythos. 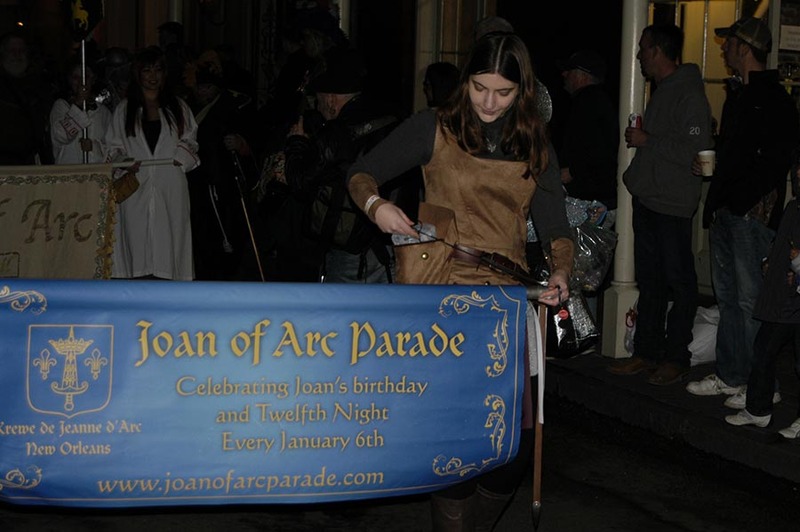 Joan of Arc’s birthday is January 6th, which coincides with Twelfth Night; a very important night for any city that celebrates Carnival. (This year marked her 60oth birthday). 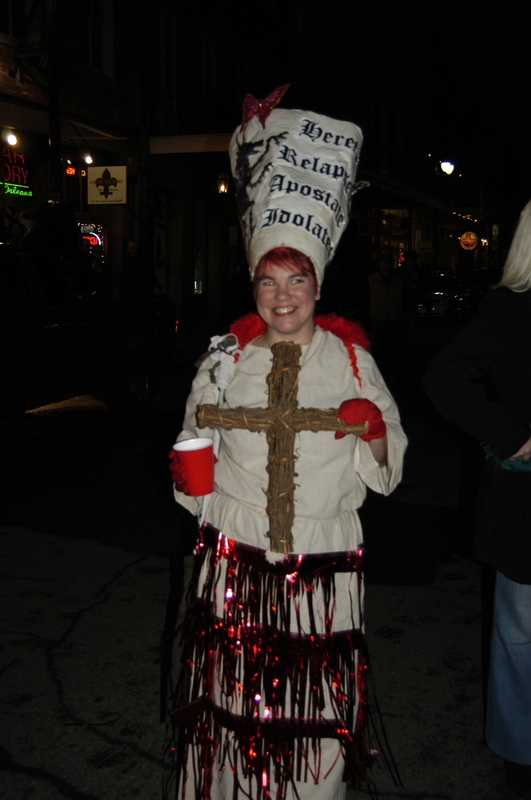 So why talk about a Catholic saint on a Pagan blog? Joan of Arc has always fascinated me. 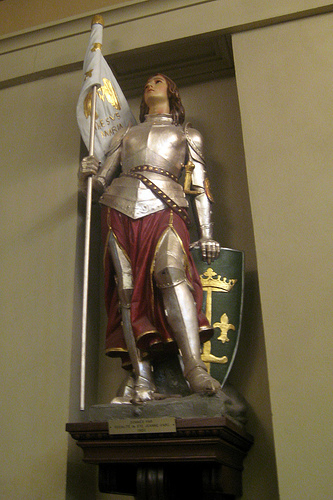 Unlike many other feminist icons, it’s impossible to rewrite Joan of Arc as anything other than Catholic. And unlike many other religious icons, we have many primary sources available to us to tell us the details about her life and death. But what I find the most fascinating about her is the fact that her faith was what allowed her to do the things she did. She was a Believer. At the end of the day, it didn’t really matter what religion she was practicing, or of what entities she was having visions. 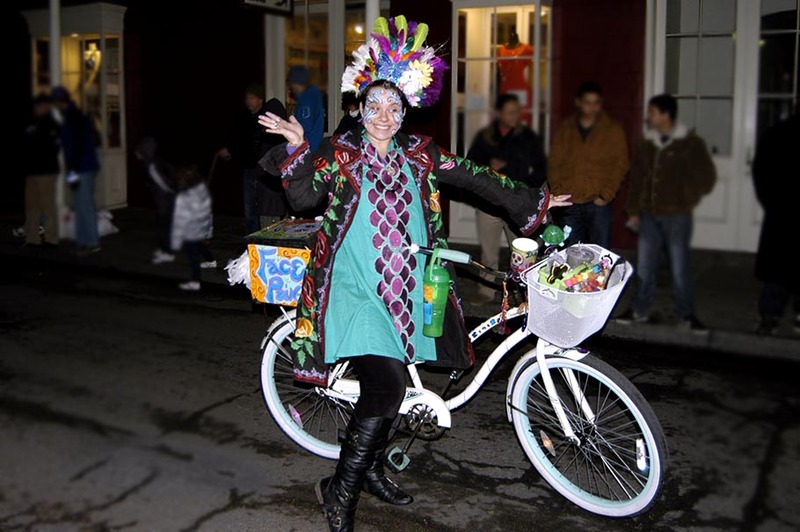 She did what most Pagans hope to be able to do: She used her visions and discussions with the divine to help her change the world. Think about it: an illiterate 16 year old girl convinced a King and his veteran generals to allow her to lead their army against an enemy they had been fighting for over ninety years, in a time when women were not allowed to be part of martial life at all. All of this under the religious auspices of a faith that gives very little power to women, even today. And unlike many powerful women of that era, she was not burned at the stake because she was accused of withcraft, but because she was accused of Heresy. One of the most powerful things I’ve seen done by Priests and Priestesses is the Drawing Down. Invocation of a God or Goddess is an intense experience. When my partner draws down our patron God, his eyes change color, he smells different, and it’s obvious that he is no longer “at home”. This is one of the penultimate tasks of (at least Wiccan) Priests and Priestesses. As a Wiccan, I get to talk directly to my Gods, and this is one of the major things that separate us from other religions. This is, of course, not the only way, and certainly not the easiest, but it is a major part of the spiritual experience of being Wiccan. While drawing down the moon is practically the most awesome think I can conceive of, it’s often absent from a lot of Modern Pagan Ritual. There are certainly groups who still make it a central part of their rites, but that seems more like the exception these days. There are a lot of reasons for this. Drawing down the moon is hard work, a lot of people aren’t ready to do it, and it’s not something you generally see at (open) large rituals. It’s also such an overwhelming experience for everyone involved (Priestess and circle-mates) that it’s generally not a good idea to do in certain (most) circumstances. By its very nature it’s something that requires a well trained clergy. This is is one of the “secrets” of Wicca that will be lost if we continue to “learn” Wicca from books. This is something a book just can’t really teach you and it is definitely not something I recommend you try if you haven’t had years of training. I’ve only started to learn the very basics of what leads up to this and it is not the sort of work you do lightly. 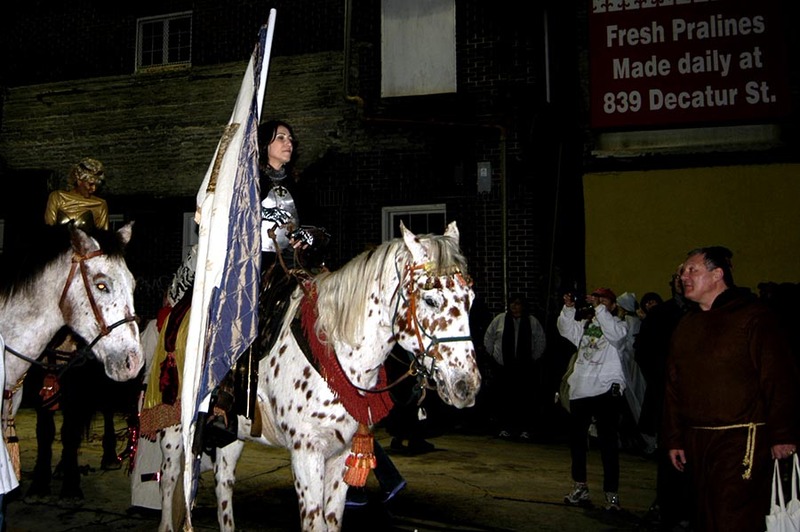 While Joan of Arc may not have been Drawing Down the way Pagans, do, she was certainly having her own direct experience with deity through her religious tenants. I think anyone who can do this is pretty amazing. And the fact that her story has stood up to the test of history, and is still very present today, is a pretty powerful message about the the need for people who can speak directly to the divine and who can take the message they hear with them out into the world. 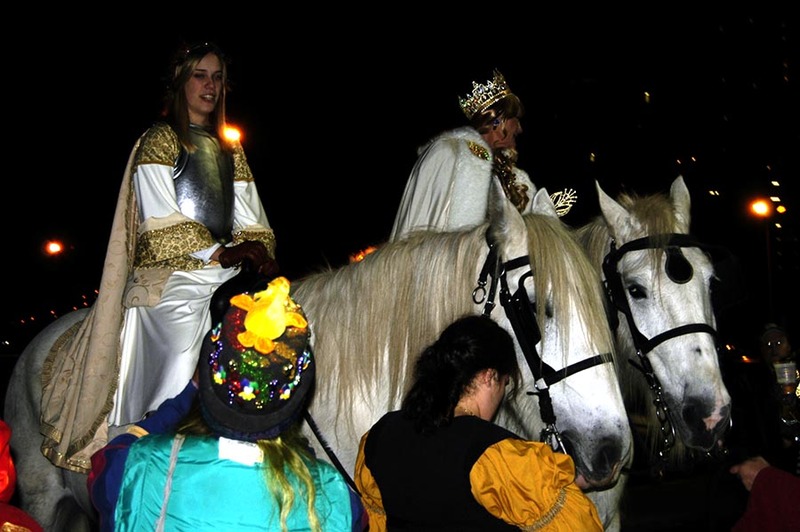 In this modern era of science and technology, the divine is still with us, and people like Joan of Arc and our priests and priestesses help remind us of our connection to it. 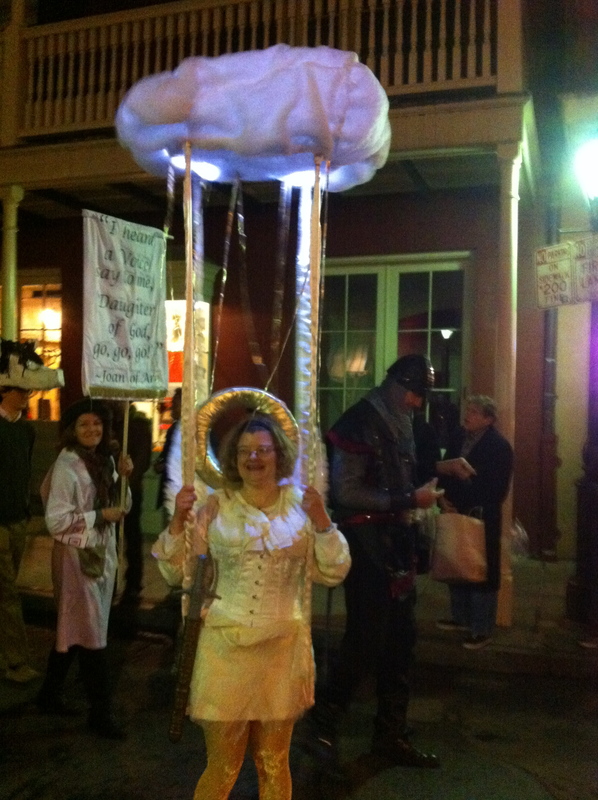 I’m glad that I live in a city that celebrates her. One of the Saints who visited Joan. 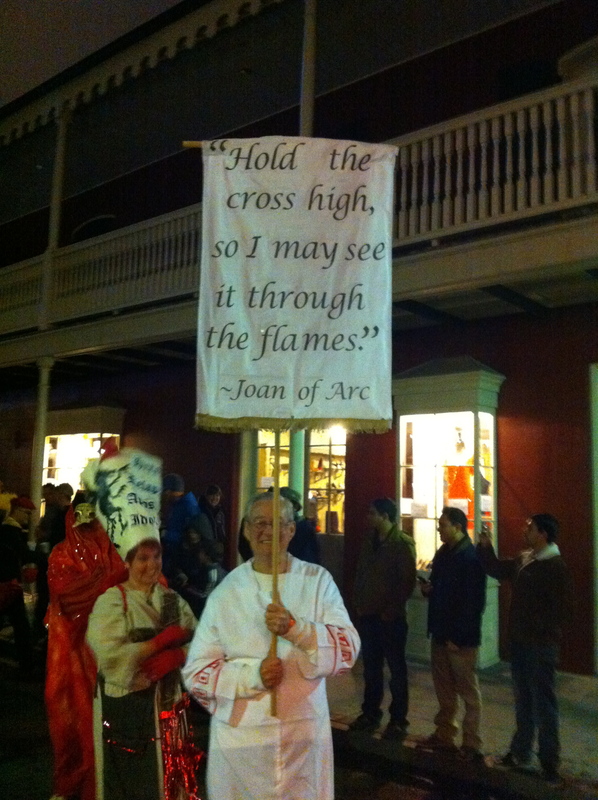 There were many people who carried banners with quotes from Joan of Arc, she said this right before they burned her at the stake. 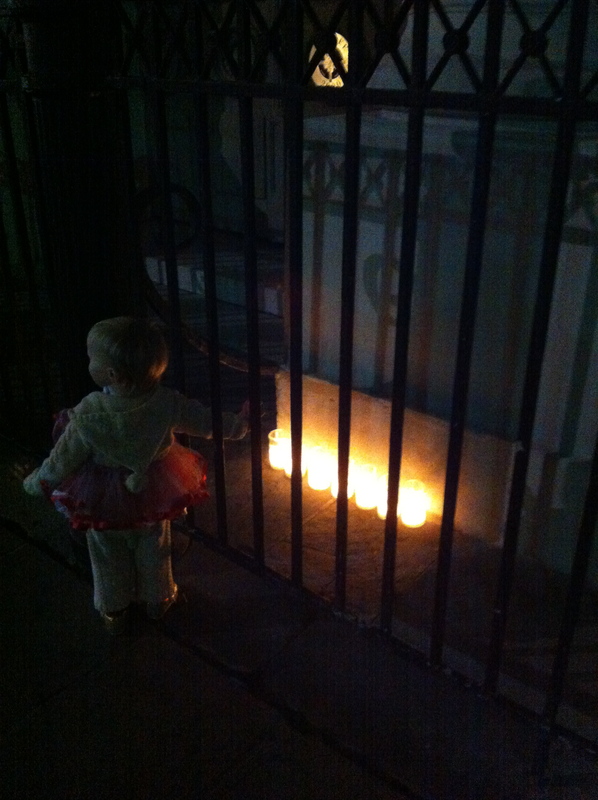 At the end of the parade, candles lit in front of the cathedral doors after they blessed St. Joan’s sword and moved on down to Chartres to get to the famous statue.